Can you picture a hair salon, ballroom, pirate ship or fairy land in your house? 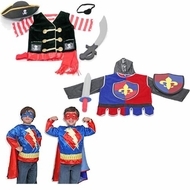 With our high-quality role-play sets, your child can! Give dress-up playtime a creative boost with costumes that inspire the imagination. Each set includes an adjustable tunic with embroidered embellishments, plus durable, wipe-clean accessories—many with realistic sounds! The machine-washable costumes slip on and off for easy everyday play. They’re perfect for Halloween, too!